mrsimcard | Get it before you go. Get it before you go. USASIMS.US – USA / UK Simcards. Apple’s built-in Messages app can send both carrier-based SMS/MMS to any phone and data-based iMessages to any other Apple device. 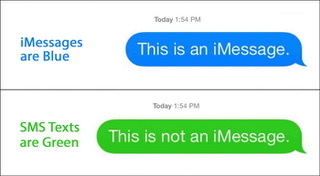 To make it easy to tell the two apart — and so that you know what might be charged as SMS/MMS vs. part of your data package – Apple color-codes all your messages. Blue is for iMessage. Any time you’re on Wi-Fi or using cellular data, and you send a message from your Apple device to another Apple device, it’ll be contained in a blue bubble. Green is for SMS/MMS. Any time you’re on the cellular network and sending to another mobile phone, it’ll be contained in a green bubble. If iMessage is offline, your iPhone may try to send over SMS/MMS, so keep an eye on it if you want to avoid charges, especially international charges outside of any texting plan you might have. O2 Big Bundles – Now with up to 18 Gigs of Data in the UK and 44 “Europe Zone” countries. **Maximum data usage in Europe Zone is 10GB of the Bundle Allotment. Enjoy 4G data service all over Europe without the worry of roaming charges when you get back. Why would you do it any other way? With an O2 Big Bundle Sim from MRSIMCARD It is all prepaid. With an O2 Big Bundle, you get up to 3000 minutes and 6000 texts valid for calls and texts to EU numbers, up to 18 Gig Data along with $5 MRSIM WorldTalk for International Calls. Our WorldTalk addon supercharges this sim for maximum International calling. Our $0.99c sim works perfectly in your unlocked smartphone for seamless coverage all over Europe. Our sim works in all these places with talk text and data included. Austria, Azores, Belgium, Bulgaria, Canary Islands, Croatia, Cyprus*, Czech Republic, Denmark, Estonia, Finland, France, French Guiana, Germany, Gibraltar Greece, Guadeloupe, Guernsey, Hungary, Iceland, Ireland, Isle of Man, Italy, Jersey, Latvia, Liechtenstein, Lithuania, Luxembourg, Madeira, Malta, Martinique, Mayotte, Monaco, Netherlands, Norway, Poland, Portugal, Reunion, Romania, Saint Barthelemy, Saint Martin, San Marino, Slovakia, Slovenia, Spain, Sweden, Switzerland, United Kingdom, Vatican City. – Place your sim order online. It ships same day. Sims are $0.99c. – Advise us your travel date and we will activate your service 1 day before. – Get setup before you travel. Set the APN and start talking & surfing the moment you arrive. Call +1 703-9532272 or +44 7700 304300 with Questions or for wholesale orders. GoSmart Mobile Unlimited USA / Social Media Sim. GoSmart includes Unlimited USA calls and Unlimited Global SMS to 200+ countries from the USA and 16 roaming countries. USA of course includes the lower 48 states, Hawaii, Puerto Rico, St. Thomas, St. Croix and St. John. See the latest coverage map here. No Coverage in Alaska. Wi-Fi calling is of course supported and requires a Wi-Fi calling capable handset and a Wi-Fi calling capable sim card. GoSmart Mobile does include Unlimited 4G LTE access to Facebook & Facebook Messenger. This sim is tops for iPhone and Android and includes unlimited Social Media – WhatsApp, Insta, Facebook…etc. Claro Honduras has announced the following promotions for February 27th, 2018.
i. Promotional Balance does not apply for customers with the 10×1 promotion. Claro Guatemala has announced the following promotions for February 28th, 2018. The Balance Promotion does not apply to clients within the 10×1 plan. ZipSim is the premier short term SIM card designed for visitors to the USA. ZipSim is self activating so it is ready when you are. Just insert the sim, power the phone and text your zip code to 7850. Receive your mobile number right away and Enjoy. ZipSim is available as data only for tablets or talk text and data for Smartphones and Blackberries (BB10). Add a little bit of ILD for $5 if you need International Calling and call worldwide with MRSIM WorldTalk. Its available in $2, $5, $8, $10 increments. ZipSim runs on the nationwide GSM network of T-Mobile which feature unlimited talk, text and Full Speed 4G LTE data. 4.500MB, 1GB, 1.5GB, 2GB 4G LTE Data. 5. There is no contract or no credit check required. Its Ready when you are – Only ZipSim has Self Activation.